Have a dry patch in your front and/or back yard? Can't get anything to grow there? 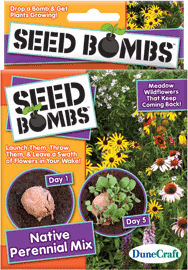 Try a Seed Bomb. According to makers Dunecraft, Seed Bombs have been around for a long time- like 1930's long. Basically, a Seed Bomb is a ball fashioned out of red clay and pete moss. The shell protects a precious cargo of seeds that, once enough rain has fallen, will sprout and actually begin to take root. Before you know it, a full square foot of empty space will have been greened up for your enjoyment. Seed Bombs will sprout about a week after being hydrated and will grow to cover a square foot each! They are easy to sprout with a little water and can last for years. DuneCraft’s inaugural series include Butterfly Seed Bombs, Herb Seed Bombs, Grass Seed Bombs, and Perennial Wildflowers Seed Bombs. The earliest records of Seed Bombs date back to the 1930’s. Seed Bombs are widely promoted by natural farming as a method of propagation. Starting this Spring, you can nab some Seed Bombs for yourself at a bunch of retail outlets including Urban Outfitters. Or, of course, you could also check out dunecraft.com and order some right now.